The field of nursing offers lucrative careers. Nurses simply need to complete a nursing program and earn a degree; once complete, doors to a broad range of employment opportunities open. Registered nurses make an above-average income while helping patients to live healthier and longer lives. However, as great as a career in nursing is, many nurses are choosing a new path: nurse practitioner. Many nurses seek new opportunities for advancement by returning to school to become a nurse practitioner. But why make the switch from RN to nurse practitioner? Nurses are discovering that nurse practitioners have more career advancement opportunities and higher salaries. And these are only a few of the many of benefits to becoming a nurse practitioner. You likely refer to anyone who isn’t a doctor as a nurse. However, there’s a big difference between registered nurses and nurse practitioners. Registered nurses tend to work in hospitals where the environment is often stressful and always changing. Nurse practitioners, on the other hand, have additional qualifications and are able to work in private practices. The staff in your doctor’s office is likely filled with nurse practitioners, while the professionals you meet in urgent care, emergency rooms, or hospitals are RNs. Nurse practitioners make their own decisions and work under their own authority. Registered nurses must be managed directly by a qualified doctor. Registered nurses are only required to have an associate’s degree. All nurse practitioners have to hold a master’s degree. Nurse practitioners can see patients on their own in a private setting. Unlike registered nurses, nurse practitioners can refer patients to doctors or specialists. Nurse practitioners are licensed; registered nurses only have to pass a state certification exam. Ability to specialize: Nurse practitioners can choose to specialize in particular types of care, and these specializations can increase a practitioner’s income potential. Writing prescriptions: Licensed nurse practitioners are legally allowed to write prescriptions, and this increases their value in any workplace. Prominent roles: Nurse practitioners have elevated qualifications that lead to more prominent roles. Many nurse practitioners manage office operations or work with doctors as colleagues on an equal level. Working in private settings: Most people who work in the healthcare field prefer to work in private practices because these institutions tend to offer relaxed schedules and higher pay. Nurse practitioners have the qualifications necessary for private practices, so many graduates are able to find jobs in a private setting. 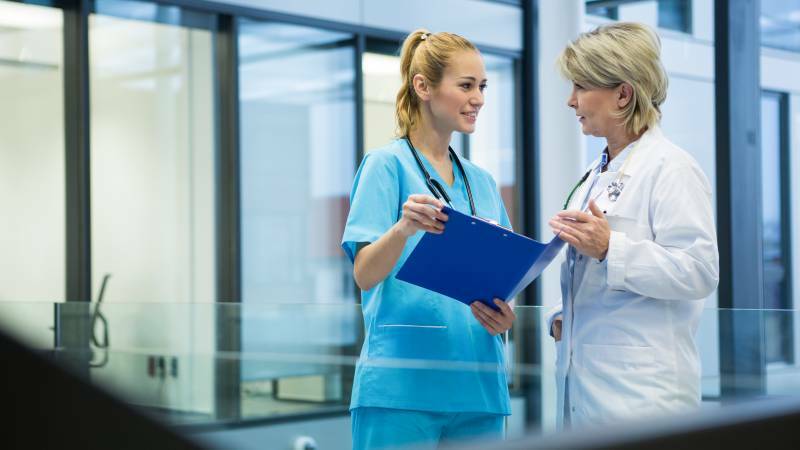 Diagnosing patients: Unlike registered nurses, nurse practitioners can legally diagnose patients without needing authorization from a licensed doctor, and they can also explain the specifics of a diagnosis to a patient directly. Individuals interested in becoming a nurse practitioner have to take on more training than an ordinary registered nurse – but that doesn’t mean you must spend years studying. It can take as little as one year to become a nurse practitioner. You can take classes at night, continuing to work and make money while you attend school. And some employers are often willing to cover tuition costs. Once you’ve earned your master’s degree, you then have to decide whether you want to pursue a residency program. Although residency isn’t a requirement for receiving a license, many students choose to enter one of these programs before getting their first job. Residency programs help students to navigate through the licensing process while providing additional training that helps build a resume. Planning ahead is the most crucial part of the process of becoming a nurse practitioner. Students who establish a clear path forward are able to avoid potential roadblocks and delays. In order to become a nurse practitioner quickly and affordably, it’s important to know, compare, and consider your options ahead of time. If you are contemplating becoming a nurse practitioner, the first step you should take is to conduct online research for your future. With an online search, you can find solutions to the barriers that are preventing you from advancing while getting your first job as a nurse practitioner in less time. You can learn the costs, what classes to take, and what great possibilities lie ahead. Interested in becoming a nurse practitioner? Start a search today.